As previously established, I am not now, nor have I ever been, an adventurous eater. However, I’m currently Andrew Zimmern in comparison to my childhood diet, which consisted almost exclusively of bread, fruit, raw vegetables, and fried pasta with cheese. When I was feeling really adventurous, I’d have some mashed potatoes. Seriously, it was a banner day in our household when I agreed that McDonald's fries were edible. Because I hated cooked veggies, and also because they aren’t really a Russian staple, I was never exposed to green beans at home. 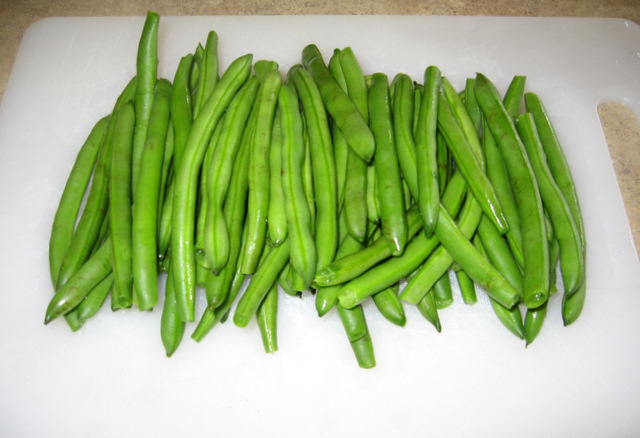 I loved fresh peas straight from the pod, but while superficially similar, when seen in restaurants, cooked green beans looked about as far from appetizing as you could get. In just the past year or so however, I’ve occasionally and very tentatively tried a green bean here or there, and they aren’t nearly as repulsive as they appear. Not particularly flavorful, mind you, but sort of mild and neutral tasting. The other day, I saw some green beans for sale for $0.99/lb, and thought that my husband(!) might enjoy this novel (for my cooking) vegetable. Once I brought them home however, I realized I had no idea what to do with them. Searching my favorite recipe website yielded two potential options: Green Beans with Walnuts and Green Beans with Almonds. I had all the ingredients for the walnut recipe on hand, so I decided to go with that one, and am so glad I did, because this dish turned out delicious, although mostly due to the onions, walnuts, and coating involved, and not so much because of the beans. 1) Preheat oven to 450°F. Line a baking sheet with foil. 2) Wash beans, then snap off the stem ends, taking off as much of the string as will come off with the ends. Below are my beans, lovingly and individually washed just as my OCD dictated. 3) Cut the onions into wedges, like you would to caramelize them. 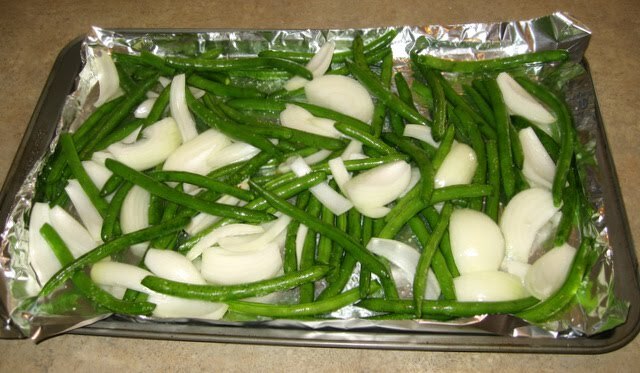 4) Apply the tablespoon of olive oil to the beans and onions, and make sure they are evenly covered. Most people just chuck everything onto the baking sheet and use their hands to coat, but I hate getting the oil all over myself, so I threw the vegetables into a gallon size zip-lock bag, poured in the oil, and then sealed and shook before dumping everything on the baking sheet. 5) Sprinkle the ½ teaspoon of salt over the oiled beans and onions, using either your hands or tongs to coat, and make sure the vegetables are distributed in an even layer. 6) Roast for 10 minutes. While the beans and onions are roasting, mince the thyme and slice the garlic. In a small bowl, mix together the balsamic vinegar, honey, thyme, and garlic. Add in a little more olive oil if the mixture congeals around the honey. 7) After 10 minutes take the beans and onions out of the oven and drizzle with the mixture, using tongs to coat everything evenly. Put back in the oven for 12 more minutes, so that the onions have dark brown spots and the beans begin to shrivel. 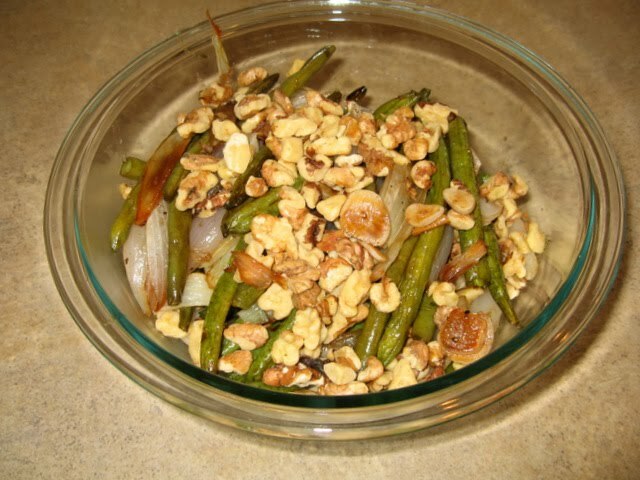 8) While the beans and onions roast, toast the walnuts for a few minutes in a small frying pan. Stir frequently so they don’t burn, and take off the heat when they smell delicious. 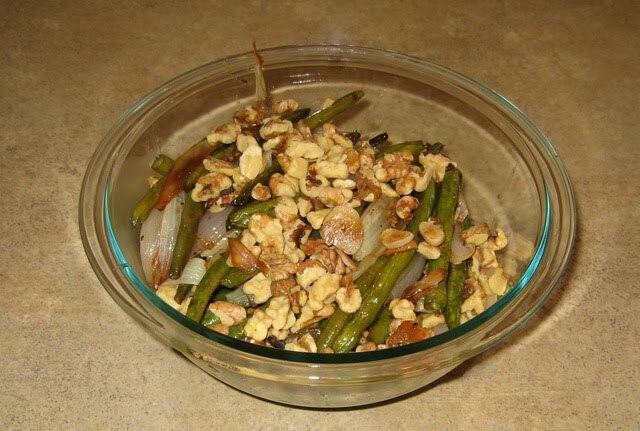 9) When the beans and onions come out of the oven, grind some pepper on them, season to taste with more salt if needed, and then use tongs to transfer to a serving dish and sprinkle with the toasted walnuts. Having witnessed your limited eating repertoire growing up, I'm very impressed with the cooked vegetable venture.